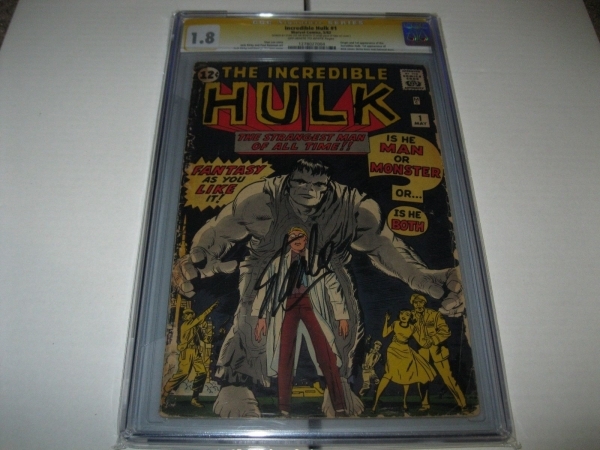 THE BOOK ABOVE IS A 100% REAL HULK #1 CGC 1.8 SIGNED SIGNATURE STAN LEE. THIS IS A VERY TOUGH BOOK TO FIND SIGNED BY STAN LEE. This is a very important book to me. I have a lot riding on this book and I hope it does well on auction. I de listed this book from auction last time because of errors in the listing. This time this book will not be unlisted at any point. Sorry for the trouble and good luck to all. ALL CGC BOOKS I HAVE LISTED DO NOT HAVE CRACKS OR DAMAGE TO THE CGCS. ALL COMICS OR CGCS I HAVE LISTED WILL BE SHIPPED THE DAY PAYMENT IS RECIEVED OR THE FOLLOWING DAY. PAYMENT MUST BE AS SOON AS POSSIBLE. 3 DAYS AFTER AUCTION. IF THERE ARE PROBLEMS PLEASE MESSAGE ME. I WILL SHIP THIS BOOK IN A BOX NOT A PRIORITY MAIL BOX, IT WILL ALSO BE BUBBLE WRAPPED FOR THE BOOKS PROTECTION. THE BOOK WILL BE SHIPPED PRIORITY MAIL OR ANY SERVICE YOU WOULD LIKE ME TO SHIP IT WITH.SHIPPING IS 15.00 AND EACH ADDITION CGC IS 3.00. I WILL SHIP INTERNATIONALLY, BUT YOU NEED TO CONTACT ME BEFORE YOU PURCHASE THE ITEM, TO DISCUSS SHIPPING COSTS. I WILL BE LISTING OTHER ITEMS SO CHECK MY ITEMS. FEEL FREE TO MAKE OFFERS ON ANY OF THE BOOKS I HAVE LISTED, ALL WILL BE TAKEN INTO CONSIDERATION. HOPEFULLY I CAN HELP YOU HAVE A GREAT EBAY EXPERIENCE.